The government is preparing for a 2015 power crisis. This crisis, according to the testimony of Department of Energy Assistant Director Irma Exconde before Congress last October 2014, is basically a 31-megawatt shortfall in supply for around two critical weeks in April. March is now ending. Early mornings are still cool, but warming. The truly hot summer can start anytime soon. We probably still have a week or so before the crisis begins to be felt. Here is a simple way to prevent brownouts from occurring in Metro Manila. Other electric utilities and cooperatives can use the approach too, if at least one TV station covers their service area. Imagine a screen that shows the available electricity supply in megawatts (MW) as a horizontal line near the top of the screen. Imagine the actual demand, also in MW, tracing another graph on the same screen?in realtime?from 7 a.m. to 11 p.m. 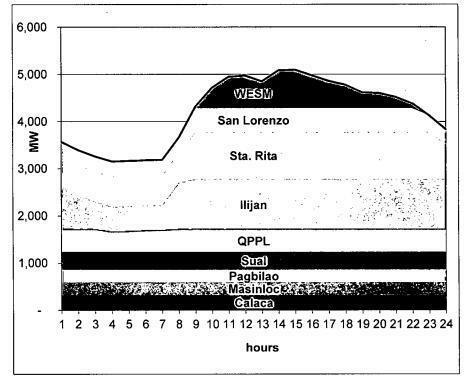 The 24-hour load curve of Meralco in shown in Figure 1. This is not difficult to do. I have seen such displays in the offices of suppliers of electricity. I am sure the Department of Energy can produce such a display. Now, imagine the trace of the actual demand inching up, as we rise in the morning, turn on some appliances and do our chores. Later in the morning, the graph rises faster, as the people arrive in their offices, turn on the lights, the airconditioning, and their computers, and as factories and workplaces start up machines and other electrical equipment. As the sun rises higher in the sky, more aircons and electric fans are turned on; aircons work harder. The demand curve is now approaching the horizontal supply curve. The drama is building up. Now, imagine television stations broadcasting the same screen, and the Secretary of Energy?or the President himself?explaining on TV that each individual can do something to prevent a brownout. They only need to turn off some of their less important electrical loads: lights in unused rooms, along corridors; one of three electric fans, postponing ironing to off-peak hours, and so on. Some will surely respond, especially if a prior media build up had been orchestrated earlier. One million responses?each turning off a 40-watt or so load (one fluorescent or incandescent lamp, one electric fan, or one computer)?is more than enough to cover the 31-MW shortfall. As the responses come in, the demand curve takes a noticeably less steep path, but it keeps approaching the supply line. The tension is becoming almost unbearable. On radio and TV, the Secretary sends out another desperate appeal. Seeing that their actions did have some effect on the curve, people will respond some more, and urge others to act too. A critical mass of people now realize that it is better turn off some appliances on your own, than lose all power. Text messages fly, urging participation. Watching the demand curve now feels like watching, live on TV, a typhoon that is about to hit. but it is also swerving, thanks to people’s earlier responses. Thus, more will be encouraged to join in, or to do more. It becomes a challenge, a race against time, or?if you will?a game: do we win or do we lose? If we win, one can surely imagine a collective cheer in every home and office watching the screen, as if Pacquiao had just scored a knockdown. But this time, it is everyone’s victory. If we lose, a brownout happens somewhere in the grid, as the system sheds some load to avoid overheating the generating plants. One can imagine hearing a collective sigh throughout the island. But with some loads shed off, the demand will drop below the supply line again; we are back in the game! Imagine doing this everyday over a two-week period, as we collectively struggle to spare the country from brownouts by pressing one switch and then another, as if we were playing an online game. It will be the greatest drama of the summer break. With a more sophisticated display, we can make the “game” more interesting (though this is not absolutely necessary). We can split the grid into four sectors, and split the screen into four too, each quarter of the screen showing the demand curve and supply line for each sector. Only those sectors that fail to turn off enough loads get the brownouts. Now it becomes a contest between sectors too. But everyone can win, if they can, collectively as a sector, manage to swerve away from the supply line without hitting it. There is no way this won’t work! This can become our national game every summer. By the way, this approach is called demand-side management (DSM). The secret here is instant feedback. People can see right away the results of their collective act. If you can see that what you are doing matters, you are bound to do more of it. Remember: all this needs is for the Department of Energy to set up the screen and the media to broadcast it. The public will do the rest. We will because we do not want to be billed that P450 million .